Physiotherapy aims to reduce pain and restore movement and function for patients affected by illness, injury, disability or ageing. You will be asked questions relating to your problem by your Physiotherapist, which will lead on to a detailed physical assessment to determine the diagnosis and best course of care and management. The tailored physiotherapy treatment may incorporate more than one therapy, including manual therapy, soft tissue therapy, electrotherapy, taping, acupuncture and other modalities. Your physiotherapist will offer advice and prescribe a dedicated exercise program to enhance treatment and prevent recurrence. Vestibular disorders can result in vertigo, dizziness, visual disturbance, and/or imbalance and falls. Vestibular Rehabilitation Therapy including Cawthorne-Cooksey exercises is an effective exercise-based programme designed to reduce these symptoms and other secondary symptons that may arise. We also offer the Epley manoeuvre to treat BPPV (BenignParoxysmal Positional Vertigo). At the Orchard Clinic, sports massage is effectively used to treat all levels of athletes and all types of sports injuries. Orchard Clinic has been a recommended London Marathon Injury clinic for over 6 years and several members of our team have experience of working with elite athletes and dancers and also in strength and conditioning. Anybody suffering from muscle soreness or tension will find this treatment beneficial. We will carry out a thorough assessment and will diagnose your problem taking into account all contributing factors such as footwear, equipment and skill-specific technique. Acupuncture is a treatment originating from ancient Chinese medicine in which fine needles are inserted into certain points of the body for therapeutic or preventative purposes. 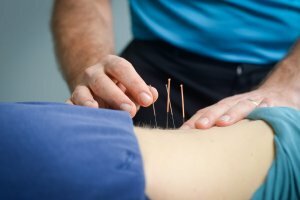 Acupuncture is an effective treatment used for relieving the pain, inflammation and muscle tension that arises with many injuries. It is not always a standalone treatment, and may be used alongside other physiotherapy treatments, advice and exercise. Similar to the scanning device used in baby scanning, we use this to assess the contraction of the core abdominal/pelvic muscles, in order to ascertain if these muscles are working optimally. If they are not, strategies on how to activate specific muscles will be advised. Successful training images will be viewed in the real time biofeedback ultrasound scanning screen. Improved core control is extremely beneficial in relieving back pain. Orchard’s Physiotherapists have, or are working towards, Post Graduate specialised Physiotherapy qualifications required to attain a Masters degree in Manual Physiotherapy and membership of the Manipulation Association of Physiotherapists. This means our team have undergone extensive training in hands-on treatment (manual therapy). Because of this, a variety of techniques can be used to help alleviate the pain and stiffness experienced with muscles, joints and nerves throughout the body. Due to the postures we adopt at work or in our leisure time activities, e.g. driving or sitting looking at monitors / screens, many of us suffer with aches and pains as a result. Our team will help identify the imbalance causing the pain and will address this dysfunction ergonomically and will correct any imbalances through a variety of treatments. Treatment can involve soft tissue massage, joint mobilisation, acupuncture and taping. We also prescribe exercise routines and postural advice to prevent recurrence. Home exercise programmes are extremely effective in assisting patients to recover from injury, and are very often used in conjuction with other treatment techniques. Following a clinical assessment, our Physiotherapist will recommend a home exercise programme designed specifically for you, to improve joint mobility, muscle flexibility and strength. A tailored exercise programme will be structured for you by the Physiotherapist, based on their findings from your extensive clinical assessment. We recognise that some conditions may also benefit from the use of Electrotherapy treatment, which is usually provided by means of therapeutic ultrasound. This treatment, can be used to reduce inflammation, increase blood flow, breakdown scar tissue and promote healing in conditions such as Achilles tendinopathy, tennis elbow and muscle tears. A non-painful treatment, this is normally used in conjunction with other treatments.
" I have been attending Orchard Clinic since the 1980's. I have always received excellent treatment and would highly recommend their physio services. Prompt treatment from highly experienced professional staff. " " Orchard Physiotherapy practitioners provide me with the frequent and vital treatment I need to manage my degenerative chronic health conditions. Without their specialist knowledge and care I would be unable to work and live the full and happy life I enjoy. Their reception staff, Pilates teachers, and physiotherapists provide invaluable support with a smile! " " As a large family we have been using Orchard Clinic for over twenty years in respect of various injuries from hypermobility, foot injuries and back complaints. We have found all the staff to be friendly, courteous and exceedingly knowledgeable in their advice and treatment. We would not hesitate in recommending them. " " Thank you for such a positive and pain relieving experience! I arrived in a terrible state but with lots of patience and care am now able to cope with daily life! I am grateful for such a patient and understanding approach that has been non-judgemental and positive every step of the way! " " Thank you. I am pain-free since my first appointment (I had two in total). I do not need painkillers and I sleep better too. I have a good range of movement in my arms, and the exercises are really simple. I have been given very good advice about posture too. " " I have been fortunate enough to work with four or five physios at Orchard Clinic over the years. They have been consistently effective and helpful - and always friendly. Good assessment and explanations of pathology; straightforward exercise regimes; persistent attention. I am currently working with Paul. He is exceptional. Very high quality work - of the highest standard. " " A visit to Orchard clinic always helps. A powerful blend of friendliness and professionalism always makes a difference to the problem. Strongly recommend. " " Thoroughly professional service. Honest appraisal of back problem enabling me to carry on life as normally as possible, with appropriate treatment. " " I have always found the staff very attentive, very professional, and very friendly. Have been using them over a number of years now. " " When I visit the clinic my concerns relating to my condition are listened to. The treatment plan is quickly put in place and implemented. The overall experience is one of progress to help me manage my ongoing problems. My physiotherapist does her best to help me. " " Sarah my physiotherapist has been a star. She has taken me a winging patient with a pinched nerve in my neck in agony and in a few short weeks I am pain free, and taking no meds. I am not keen on needles but Sarah performed acupuncture and I am positive this cured my nerve pain. Thank you so much Sarah I will not hesitate to see you again for any other injuries. " " Paul's diagnosis and treatment are amazingly thorough and accurate. He is seeing me through a hip replacement and allowing me a much higher quality of life than I expected. I am so grateful. " " I first came to Orchard Clinic to have physio which sorted out my neck problems - by taking a weekly Pilates class at the Clinic for the four years since I have managed to keep all aches and pains at bay. Great staff and a lovely atmosphere. Well done all! " " After an initial consultation I have taken up Pilates for my back. The classes are fantastic - tailor-made, small group and the loveliest teacher (Julie). I am much more in control of my back pain now and it has really helped. Thank you! "